So you want to learn How to Start a Blog? We can’t be more excited as we believe business blogging and content marketing are extremely important for businesses who want to thrive the digital marketing space. Content is an integral part of our marketing strategy and we’ve seen amazing results with regular blogging and we’ve achieved great results for our clients who work with our retainer model. Now before we go into detail about how to start a blog let’s take a look at the benefits of Business blogging as we believe every business should blog . Content is the fuel that accelerates your growth online as it helps you get more traffic. In order to rank high in Google you need more and more content. Social Media: If you are active on social media and consider it as an important part of your online marketing strategy then you need to share content as you can not build an audience by sharing other peoples content, this does work for sites like UPWorthy and Viral Nova but it doesn’t work for businesses who want to generate leads online. While it is a good practice to share Industry related news and updates to show your audience that you keep an eye on things in the Industry, you need to share your own content to drive visitors back to your website. Search Engines: In order to get traffic from Search Engines you need to have pages on your website that are about the topics people are searching for and blogging helps you achieve that as every time you write a post, it’s one more page from your website that gets indexed in search engines. Every new indexed page is opens up an opportunity for you to show up in search engines, and drive traffic to your blog and website through organic searches made by people who are looking for help and solution to their pain s and problems. Through blogging you are not online building up traffic on your website but also actually help people by writing on topics that are near and dear to your audience. Lastly, blogging can also help you build links, now how about that? Imaging building links on auto pilot but just hitting the publish button. 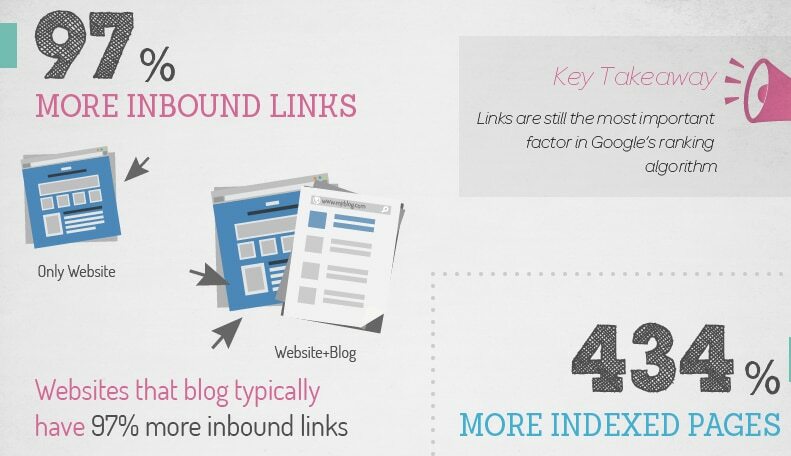 Neil Patel published an Infographic which revealed that business blogging can get you 97% more inbound links as compared to websites who don’t blog at all. Blogging does not only help you get more traffic but it also help establish yourself as an authority figure in the Industry. If you are consistently creative exceptionally great and helpful content and solving peoples problem then people will think of yourself as an expert. Now think how can it help your business as your audience will take your word in any decision they take and it can become a valuable asset that you can leverage, but remember, it doesn’t fit for big brands only. Small brands can leverage the power of blogging and content marketing to establish themselves as an authority in a small amount of time. Let’s picture this for a small business, a dentist for example. How can a dentist operating a small clinic get clients with business blogging? They can use blogging to answer the questions people are asking and searching for online. This helps demonstrates their expertise and skill in the field and position them as an expert. What happens when people find you from search engines whilst they are looking for solutions or answers? They take you as an expert and this helps you generate leads as people would love to subscribe to your newsletter or fill out a request form to do business with you. Every post you write brings you an opportunity to generate a lead, now this does not start happening instantly. Building authority and trust with an audience takes time that is why Inbound marketing services asks clients to commit for a minimum of 12 months so they can evaluate results at the end of that time period. You can not and should not expect first time visitors to purchase from you, but once you keep blogging at a consistent pace you’ll start seeing growth in traffic and the number of leads your blog is able to generate for you. We invited Industry experts to share their story about how they started blogging, what have they been able to achieve with it and their suggestions for those who want to start blogging. I found software that let me post information to a website (before there were blogs) and started typing. Easy peasy. I used to write for myself. It took a long while to get the mix right. 2. What have you been able to achieve? 3. What will you suggest to other business owners? Blogging is the best lead generation you can hope for on the open web. Write stories that help a potential customer solve a problem with or without your product or service and you’ll have someone who appreciates the information you’re offering. Write unique and engaging content and you’ll have the chance to win their business. Chris Brogan is Publisher and CEO of a business magazine helping you improve your worth by growing your capabilities and connections. He is a New York Times Bestselling author of books like The Impact Equation, Trust Agents, Social Media 101 and Google Plus for Business. I started a blog and covered content that I wasn’t enjoying writing and that blog was not successful. When I started Razorsocial it was about social media tools and technology and I’m very passionate about this area and this made a huge difference. You have to be very persistent to be successful with blogging and if you are not enjoying the topic you write about your chance of success is slim! Our business is growing every year and one of the main reasons is the blog. 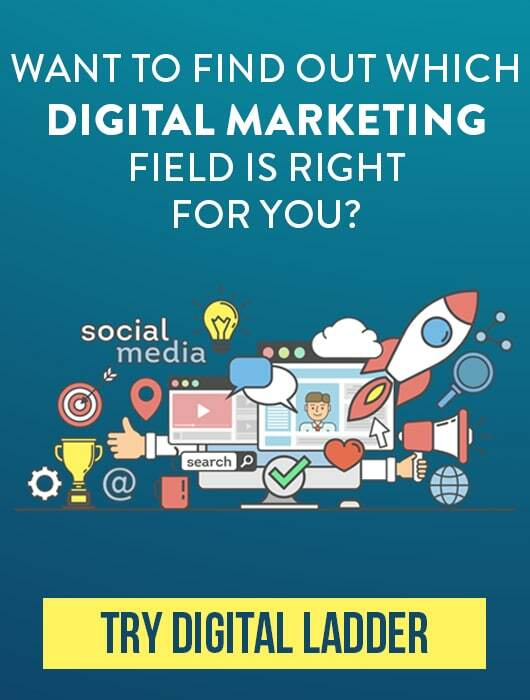 We have a Digital Marketing training business in Ireland that has grown a lot since we started the blog and we’re also generating revenue directly through the blog. I’ve also built up an amazing network of people around the world and this network is hugely valuable. Because of the blog I’ve also got the opportunity to speak at some of the largest social media conferences around the world and this has helped me establish credibility on a global scale. 1. Pick a niche – If I wrote about just social media the blog would not have grown as quickly. I researched the market first and picked a niche that I loved and nobody else was covering. This helps you stand above the noise. 2. Be Consistent – Blogging is not short term. The first 3 to 6 months will be difficult but if you consistently deliver good content and build relationships with a relevant audience the blog will grow. 3. Optimize your content for Google – Optimizing content is not about tricking Google. It’s providing relevant information to Google so that they can index your content correctly. Google will likely be your biggest source of traffic. 4. Build a community – You want to think about building a community around your blog from day one. This consists of other bloggers, businesses, subscribers to your content etc. Your community is much more than just a list so don’t treat it like a list!! Ian Cleary is a entrepreneur, speaker and technology expert who specialises in sharing unbiased information about social media tools through his award-winning website, RazorSocial. A well-respected thought leader in his field, Ian’s background in the technology sector means he presents complex information in an accessible way. My first blog was built out of necessity. I was running a none profit record label at college and trying to teach myself HTML and in my search for an alternative I found WordPress. I was quickly able to setup a blog and talk about the music we were working on. The label went from strength to strength and while my aim was never to make money from it we eventually totalled over 60+ releases by artists all over the world. Total downloads of these releases was at over 1.5 million at the last count. While this isn’t exactly blogging in the regular sense it was the catalyst that kick started my interest in WordPress as a platform and blogging in general. I then chose to do my dissertation at university on music marketing – this drove me into the marketing side of things. I took what I learned and launched a gaming blog that hit 15,000 monthly visitors within 2 months. No link building at all. Before we shut down the project we had a team of 30+ writers working for us and a dedicated YouTube team. My experience working on my own landed me a job as the operations manager for a marketing agency – I beat qualified marketers to the job just by being able to show that I knew what I was talking about. Usually simply doing my dissertation on music marketing wouldn’t get me this far. The rest was practical application. I then launched my personal blog, Blogging Wizard in December 2012 and within 3-4 months I’d grown it to 15,000 visitors a month. In March/April time we launched a new service and through the work I did on the blog and by writing for industry publications we were able to grow that part of the business to 5 figures a month within 6 months. It’s not the monstrous growth that I know some people have achieved but considering I spent 1-2 days a month marketing that side of the business (this was because of restrictions on my time due to the other side of the business I managed), it’s not bad at all. And since December we have doubled our client base. There’s no guarantee that what happened for my agency can happen for your business but people want to learn and if you help them learn exactly what they need to know you will end up becoming an authority – if you don’t know what you’re talking about then it’s going to be difficult. Ultimately it comes down to this. Find your audiences problems and solve them. If they don’t have time to follow tutorials, guides, information that you’re blogging about and they have budget then they’ll pay you. Adam is the founder of Blogging Wizard. Marketing Manager at UK Linkology. And spends most of his time helping others become more successful online. Back in June 2011 (when I launched Leaving Work Behind), I had barely even read a blog before, let alone created my own. However, I did have a bit of experience in building websites, so I wasn’t starting entirely from scratch. My early intentions were just to use blogging as a means of keeping myself publicly accountable for creating a successful online business, but in time the blog became something of a business in itself, generating both information product and affiliate income. A great deal! As I said above, the blog generates money through information product sales and affiliate income, but that’s not all. My blog was also pivotal in helping me launch a freelance blogging career and continues to refer clients my way to this day. Furthermore, I’ve got to know a great many people through blogging that I wouldn’t otherwise know. It depends upon your industry, but a blog could be a great lead/customer generation tool for your business, as well as doing wonders for your brand’s value. It’s definitely worth looking into at the very least. Tom is the Chief Blog Officer for ManageWP and he is seriously passionate about WordPress. He is also the founder of Leaving Work Behind, a blog for those who want to quit their jobs and build their best life. I started blogging at my first internship for clients discussing what they learned and their knowledge of the industry. After that I kept blogging for my various marketing roles on behalf of clients as well as on my own blog about lessons I learned as a marketer. Blogging has given my clients increased visibility, more leads, qualified traffic and positioning as a thought leader in their industry. Personally, blogging has given me the opportunity to add to the discourse in our industry and make a name for myself on the topics surrounding my expertise like marketing, social media, tech, content and business. I can’t stress enough how important blogging is for shaping your career. Even if you aren’t a good writer, make a podcast or start a YouTube channel to get quality content out there regarding your perspectives on your industry. You have nothing to lose and everything to gain by starting a blog, a video series or a podcast. We aren’t talking about a job with serious risks if you deviate from the norm like being a surgeon or an airplane pilot. One of the worst things that can happen if you start blogging tomorrow is that no one will see it. It’s a long-term effort that doesn’t happen overnight, but with hard work that you’ll begin to see results from step by step. Brian Honigman is a Speaker, marketing consultant and a freelance writer. He’s written for Forbes, Mashable, the Huffington Post, the Next Web and others. Follow him on Twitter@BrianHonigman. Too many things to count: relationships, fun, education. Starting my blog was honestly one of the best personal and business decisions I’ve ever made. It’s something I recommend that every business take advantage of. Commit today. Make no mistake: starting a blog today is a lot (A LOT!) of work. It’s not like 2004 when you were competing with 10 other blogs in your industry. That being said, if you can create a blog that stands out, you’ll get more new business than you could using any other strategy. Brian Dean is the founder of Backlinko. He is one of the most respected link building experts you can think of in today’s SEO world. I started to record my travels and then transitioned into writing for my business. As far as timelines go, I’ve been writing for about three years, but I launched my blog at jamesclear.com in November of 2012. In the first 15 months, I built my email list to 55,000 subscribers (they get emails from me every Monday and Thursday). I routinely receive 200,000 unique visitors each month. Over 2.5 million people read my work during the first year. If you’re interested in blogging, I suggest doing three things. First, set a writing schedule you can stick to. Most bloggers are incredibly inconsistent. You can win just by being dependable. Second, write better content. Spend more time researching and writing. Better stuff wins. Third, build your email list. It’s the best way to connect with a community. James Clear is an entrepreneur, travel blogger and weightlifter. Personally, I’ve started blogging as a way to document what I learn at work and through my own experimentation. To tell the truth, I haven’t put a lot of time into my own brand yet, but its on my list of things to do. 2. What have you been able to achieve through it? Over the past year or so I’ve been focused on building the digital marketing brand of the business school where I attend at Brigham Young University in Provo, UT. That I’ve done through a continuing series of interviews with names like Brian Dean and Job Cooper as well as an on-campus lecture/workshop series on a variety of different digital marketing topics. 3. What advice would you give to other business owners who haven’t started blogging yet? Blogging is a great way to establish yourself in an industry, but I feel like many people are doing it wrong now. In the past people learned that blogging was a good tool for generating traffic and decided that putting up a blog was a good idea for a business owner. If your idea of blogging is just throwing up “something,” then save yourself the time and pay for Facebook ads or something. Blogging is about bringing real value to an audience. In order to bring that value you need to understand your audience and create content that is what they want to see. And not just replicas of other successful “top ten” lists. Generate new ideas in your industry and share those ideas. Jeff Kingston is a marketing student at Brigham Young University.He has a passion for digital marketing in all forms and has spent the last 3 years working in SEO, SEM, Affiliate Marketing, and more. Feel free to reach out and chat anytime. I started blogging in January 2010, to chart my course to becoming a Virtual CEO by the end of the year. It was a way for me to keep myself publicly accountable to the goal, but was also a great brand builder and lead generation tool for my businesses, too. Way more than I imagined. I’ve amassed a great following of loyal subscribers and customers, I’ve built a speaking career, landed a book deal, grew two additional businesses, and have been able to help more entrepreneur through blogging than I ever would have by just ‘providing services’. It’s been a great journey. Start. Now. One of the biggest regrets I have in growing my business was not starting my blogging journey earlier. It would be the first thing I would change if I could turn back the hands of time. Focusing on content marketing and ultimately solving problems is what it’s all about! Chris is a serial entrepreneur, virtual staffing expert, blogger, podcaster and author who helps other entrepreneurs catapult their businesses into the 21st century utilizing what he calls the ‘New Business’ style of marketing. Make sure you check out his latest book “Virtual Freedom – More Time, More Productivity and More Freedom”. I first started with a random Blogger blog that was about absolutely nothing, heh. A quick lesson was learned that nobody cares about me or my blog, they only care about what my writing does for them. I tried a few topics before landing on Sparring Mind, which is my outlet to write about personal growth + all of that psychology research that I love reading about. It currently sits at around ~25,000 subscribers on the newsletter. Well, leading up content strategy is now my full-time job at Help Scout, and I help land said job through blogging. With the additional income that Sparring Mind creates, I live a great life working from a home office in my pajamas, helping to grow a useful B2B product and having the ability to broadcast my thoughts to thousands of people. It’s great! 3. What advise would you give to other business owners who haven’t started blogging yet? Content = popcorn, and product = iced tea. If your content isn’t creating a thirst to use your product, you’re making a mistake. You need to show prospects what to do, how to do them, and why they should do them. Educate and motivate, or don’t even both. Gregory Ciotti, marketing strategist at Help Scout. Ever have a dream so huge, but you weren’t really sure where to begin? That was me! So in August, 2010 I decided that the best way to make that dream a reality was to start blogging. So that’s exactly what I did! At the beginning, I didn’t really know what I was doing, but I was dedicated to blogging almost every single day – and before I knew it, I had an audience! about. It currently sits at around ~25,000 subscribers on the newsletter. My business is thriving because I started blogging. I was able to build real relationships with people, and gain enough momentum to be able to run my business full-time from anywhere in the world with an internet connection. I spent last month in 3 different countries: USA, UK and Trinidad – and was able to do so without worrying about skipping a beat within the business. It was AWESOME! Hone in on WHO you are trying to connect with so that you can create blog posts with those specific people in mind. Discover what makes you special, and use it to you’re advantage to help you stand out from the crowd. And definitely, definitely, DEFINITELY start a newsletter so that you can keep that communication with your audience open while providing as much value to their lives as possible. Alex Beadon is a creative portrait photographer and blogger based in Worcestershire, England. She has been able to build a massive audience in her niche through blogging. I started blogging as a tool to generate leads for my business. I just popped up a Movable Type blog at that time and start writing content. I wasn’t good at it, but over the years I learned what to do and what not to do. Blogging has helped generate revenue, and positive branding. Plus I have learned a lot over the years from my readers. I decided to start a blog after I realized how much I enjoyed finding and sharing recipes online. I’ve always enjoyed healthy cooking and the process of sharing those recipes with readers and their families was really rewarding. We’ve been able to monetize the blog to a full time income and last month we had more than 1 million unique visitors. I would suggest that you start a blog with no expectation of making money. Try it out, see if you like it, and then do your best to make it into a business by making smart decisions. The good thing about that is if you choose to do it simply because you love it, then just doing the work itself will be your reward. It’s all about enjoying the process! Lindsay Ostrom is the talented food blogger and pohotographer behind Pinch of Yum. Together with her husband, she built the Pinch of Yum, one of the most popular sites in the recipe world. If you’ve seen success with blogging, share your story with us in the comments section below.